Friday 13th October 2017 proved unlucky for some speeding motorists on Lancaster Avenue as LARA ran its first Community Roadwatch event with the Lambeth Safer Transport Team led on the day by Police Community Support Officer Bruce Hay accompanied by two of his colleagues and ably assisted by residents from the Avenue. Using a speed gun supplied by the Lambeth police team and expertly handled by one of the residents the Roadwatch team captured 78 vehicles travelling at 25mph or more in just 75 minutes between 4pm and 5:25pm. Of those 78 vehicles, 20 were captured travelling at over 27 mph and the worst offender was clocked at a staggering 42 mph. The registration numbers of all vehicles registering 25mph or more on the laser gun were recorded and have been reported to TfL by the police team. Drivers who are subsequently caught speeding a second time will receive warnings, which for the worst offenders may involve a knock at the door from Bruce and his team, and further infringements will incur stiffer penalties. Bearing in mind the presence of a nursery, two care homes and an infant school on our road and the long-standing nature of the 20mph speed limit the speeds some motorists were travelling at really does beggar belief. PCSO Hay declared the event “very busy by any standard” and plans to return, this time with 2 speed guns, for a further event in the November. He assures us that the need to return so quickly is driven by the evident problem which affects our road and not by the excellent cups of tea and good company supplied to him and his team. Anyone who lives near Tulse Hill station of commutes to work will know that the bridge over Thurlow Park Road is regularly hit by lorries who are too tall to travel underneath. We have been championing this issue with Transport for London and Network Rail. TfL have installed new technology which has reduced bridge strikes by a third, which means the trains are less disrupted and the South Circular is shut and completely rerouted down Lancaster Avenue less frequently. However, oversized lorries are still sent down Lancaster Avenue, which is a residential street and inappropriate for large articulated vehicles. 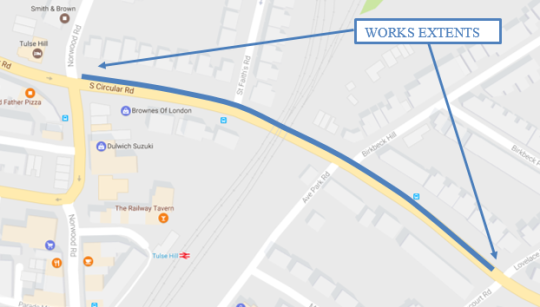 We are very pleased that Network Rail are exploring longer term solutions, in partnership with TfL, and will be conducting ground investigation works around the railway bridge to help them plan future works as part of their Railway Upgrade Plan. This includes boreholes, bridge abutment examinations and trial pits. While in the long term we hope this will lead to them investing in either raising the bridge or lowering the road, in the short term we appreciate it may cause some disruption. Local residents will shortly receive a letter from Network Rail setting out the local impact. As it is important for train passengers, road users , residents and staff to be safe, this type of work can only be carried out when trains are not operating and therefore they will mainly be taking place overnight and at weekends. We have been assured by Network Rail that staff and contractors have been briefed on how to work responsibly with the local community but would encourage you to get in touch with us if you experience any problems. Having been successfully elected Florence Eshalomi AM follows up Lancaster Ave resident association walkabout about the Thurlow Park rd bridge with question to Mayor. As local residents ill be well aware the railway bridge over the South Circular is hit by HGVs more than any other railway bridge in the UK. Every time a lorry drives into the bridge, trains to and from central London are delayed and traffic is redirected down residential streets. In the meantime, large vehicles are indiscriminately redirected down Lancaster Avenue. It is disruptive and dangerous, and we have been working with residents, TfL, and now our new Assembly Member as we want to do something to solve the problem. ‘TfL has invested in a number of measures such as clearly signing an alternative route, installing larger bridge height restriction signs on the bridge itself. In collaboration with Network Rail, it has painted black and yellow chevrons on the bridge to highlight the maximum height available to vehicles and added large “Low Bridge” signs to the structure. In addition, new electronic over-height warning systems were successfully commissioned on Friday 15 July 2016, which use infra-red beams and a sensor in the carriageway to detect when a tall vehicle approaches the bridge, triggering a warning message on a nearby sign to advise them to divert’. The railway bridge over the South Circular is hit by HGVs more than any other railway bridge in the UK. Every time a lorry drives into the bridge, trains to and from central London are delayed and traffic is redirected down residential streets. In the meantime, large vehicles are indiscriminately redirected down Lancaster Avenue. It is disruptive and dangerous, and we want to do something to solve the problem. We have been working with TfL to address the issue. Officers met with residents a couple of months ago, and recently our new London Assembly Member, Flo Eshalomi, visited the ward to discuss this issue ahead of her election. In the short term, we have pushed for better signage – which takes into account the actual height of vehicles to ensure oversized vehicles are targeted. In the long term, we want the road to be lowered so that no vehicle is at risk of hitting the bridge, and so that no lorries are diverted down Lancaster Avenue. We are pleased that action is being taken this week. London Highways Alliance Contract (LoHAC) workers, on behalf of Transport for London (TfL), are planning to modernise the Overheight Vehicle Detection Systems on the A205 Thurlow Park Road, on both approaches to the Network Rail Bridge near Tulse Hill Gyratory. The contractors will be installing new Overheight Vehicle Detection Systems and associated loop sensors, ducting and electrical connections, in order to give overheight vehicles more advanced warning of the low bridge and to divert them via alternative routes. 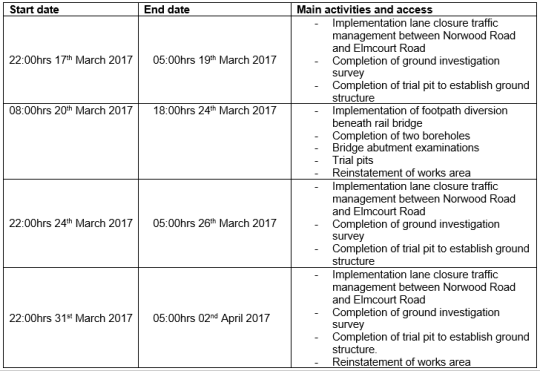 Works are planned to start on Tuesday 24 May 2016 and will be phased over approximately 10 weeks, depending on weather conditions. Footway works will take place from Mondays to Fridays between 08:00 and 18:00, and on Saturdays between 08:00 and 14:00. Carriageway works will take place from Mondays to Fridays between 20:00 and 05:00, nights only, with noisy works completed before 23:00. Ahead of 2016 GLA Assembly election we arranged for the Norwood Forum Chair, Noshir Patel, and Labour GLA candidate for Lambeth & Southwark, Flo Eshalomi, to conduct a walking tour of Lancaster Avenue and Thurlow Park Road with the bridge strike issue and subsequent road diversion the main topic of discussion. As many of you may know, the bridge on Thurlow Park Road is the most hit in the country and the impact has been of growing significance to residents and business alike. The economic cost of delayed train and car journeys, the negative effect on air pollution, the impact on road safety, the actual damage to the bridge, and the cost to train operating companies. As a reminder, we met with TfL and LARA residents last December 2015 and discussed a rage of short and long term strategies to help residents better cope with the ongoing issue. In the short term we had hoped to see better signage being installed. These would be “smart”, triggered only by oversized vehicles which should mean they are more effective. Otherwise, we had also hoped to see CCTV being installed to monitor and measure impact. In the longer term we understood that TfL would be developing a business case for lowering the road as a way to prevent bridge strikes and to remove the need to divert any traffic down Lancaster Avenue. This will take some time because it is a complicated engineering challenge thanks to bridge foundations and the sewer. It will also have a huge impact on the road, as it would have to be closed for the works to be completed. Florence was diligent in her questions and understood the need for something to be done as quickly as possible. She was keen to help and said that she would raise the matter, if elected, during Mayor’s question time. A big thank you to residents and David McKenna from TfL for yesterday’s meeting about bridge strikes on the railway over the South Circular. Long term strategy – David and his team are developing the business case for lowering the road as a way to prevent bridge strikes and to remove the need to divert any traffic down Lancaster Avenue. This will take some time because it is a complicated engineering challenge thanks to bridge foundations and the sewer. It will also have a huge impact on the road, as it would have to be closed for the works to be completed. The community will write to the mayoral and GLA candidates requesting that they all prioritise this issue. David will feedback based on questions raised by attendees, including about whether lorry drivers and their companies can be prosecuted or fined when they hit the bridge, more data, maps showing locations of signs and how the community can support his business case. The signs will be installed within the next 4 months. Feasibility studies will be developed, beginning now. This may include some drill holes and radars to identify services underground. These will be ongoing for the next few months. Once a new London Mayor and GLA member are in post, we will organise a meeting to request that this is high on their agenda. We will organise a progress meeting in approx. 6 months where David can share how he’s getting on. We can invite Network Rail and Thames Water, as appropriate. *excuse the pun, borrowed from Richard Alford on Lancaster Avenue!